I’ve got two projects rolling on the bead tray this week. I’m just putting the finishing touches on a wonderful custom necklace, and in the margins I’ve started work on one of the final Egyptian Gods pieces. Tawaret the hippopotamus goddess is my latest inspiration, and for her I’m going to try and recreate the Egyptian Sa amulet in necklace size, using 8/o seed beads. I’ve included some lovely dark amethyst in the palette, as it seemed like just the right color for a mama hippo. There’s also cobalt blue, black, and emerald green. I’m a little worried that the green might run out on me before I can get the length that I want, but I can always make this a clasped necklace, rather than the pull-over I was hoping for. I’m keeping careful track of length and beads as I go. The new collar design that I was working on last week (and the week before that) turned out great. The scalloped edges came out much better than I expected, and even though it wasn’t what I imagined, I’m really happy with the look. I might even do it again some time. My only regret is not including more lime green - it contrasts so perfectly with the blue daggers. Imagine a beading magazine with no ads - just exciting beading tutorials mailed right to your door. That would be one way to describe Pattern Collections for beadweaving created by Deb Moffett-Hall of PatternsToBead.com. This new series by one of beading’s most active kit makers is a great way to keep inspiration flowing, try new techniques, and bust your stash all at the same time. Each collection contains five assorted projects including jewelry, accessories, home décor, and ornaments - all with step-by-step directions and color photographs to guide you through the techniques. Peyote patterns include full color graphs to follow, and beautiful seasonal themes. The projects are perfect for beginner to intermediate beadweavers, and offer a wide variety of stitches to experiment with. Deb uses many different bead favorites in her patterns, including Delicas and seed beads, crystals, pearls and even two-hole beads. using some of my favorite beads. Beaders don’t need to have a color printer to enjoy these patterns - each one is mailed in full color packs that you can store and refer to at any time, and the shipping is free. Pattern Collections are available as a single issue with five projects, or as a subscription for twelve months of inspirations! My favorite project so far is the Golden Links necklace that uses openwork RAW and two-hole beads to make a beautiful pair of bead chains. Like all of the projects, the instructions are easy to follow and adapt to your current stash or favorite colors. If you’re feeling eager to get beading but don’t know what to make, Patterns to Bead Collections may be just the thing to cure your beader’s block! You can find many more jewelry tutorials, ornament patterns and beading kits at PatternstoBead.com. Many thanks to Deb for allowing me to try out the Pattern Collections. Inspirational Beading has not received compensation for featuring products in this post. The results are in, and the winner of the Spring Twins seed bead giveaway from Inspirational Beading sponsor, The Best Beads, is Kathleen. Congratulations to our winner, and thank you so much to everyone who entered! Many thanks also go out to the fantastic folks at The Best Beads for sponsoring the giveaway. The prize pack included four fabulous colors of Preciosa two-hole Twin beads. New projects for two-hole beads are appearing all the time, each one more exciting than the last. If you’re eager to try them out and need a little inspiration, these projects will help you get started using Twins! The Abby Twin Bead Bracelet by Megan Patton and Beadaholique uses a circular netting and two colors of Twins to create a pretty cuff. The Skinny Twin Cube Band by Deborah Roberti and Around the Beading Table combines cube seed beads and Twins for a gorgeous bracelet. The Twin Rivoli Pendant tutorial by SashaSi is a great way to combine twins and your favorite crystal colors. You won’t believe how easy it is to create the London’s Garden Bracelet by Beads Magic using just two-needle cross weave. There’s something irresistibly beady about striped seed beads. Whether they’re new or vintage, these multicolored beauties bring a lot of personality and charm to a design. The trouble is, the difficulty of creating the perfect palette doubles when working with two-toned beads. I’ve had a beautiful strand of red and blue striped trade beads in my stash for awhile now, and I’m eager to put them to good use; but unless the perfect inspiration comes along, I’ll have to create a design around them. I did a little brainstorming, hoping to find just the right seed bead colors to match them with. It was a lot trickier than it sounds. First I took the easy approach and went with all neutrals. Black and white 8/o seed beads match the striped ones for size, but the shiny and matte finishes seem to clash. For this palette, a great pattern would be just as important to showcase the stripes. Moving along, I went with a softer neutral in beige ceylon, then a complement in aqua white-hearts. These two colors actually go together quite nicely, but seem to over power the red of the stripe beads and make it look muddy. I was starting to think that my lovely strand of beads would not play well with others. Finally, I had to try other primary colors. Opaque canary yellow and cactus green really make the striped beads pop without looking too playful or “crayon box”. As much as I like them as a trio, I think these beads would look best as accents in an all-black piece. How do you like to use two-tone beads? I’m only one or two beading sessions away from completing the beadwork on Thoth’s collar. Normally I would have stopped to weave in a few threads by now, but I want to make sure that all of the rows get a chance for extra thread, so I’ve been saving them all until the end. This technique eats up thread so quickly that I almost can’t see the beads through all the tails. Converting the simple and structured wavy bracelet into a collar proved to be much more difficult than I originally thought it would be. I started out with a template that I traced from an existing collar, and diligently measured and checked to make sure that I was using the right quantities of beads to get the shape that I wanted. Even with all of that fussing things still went sideways, but I think it’s all going to work out anyway. Even in beadwork, fads come and go all the time - materials and techniques that are popular can be here one day and gone the next. One new trend that is too fabulous to be forgotten is soutache bead embroidery, especially when the artists who work with it are so talented. 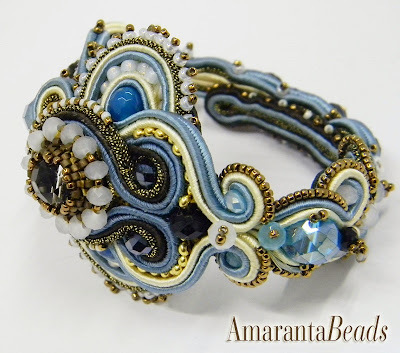 Today’s guest is Tiziana of Amaranta Beads, whose soutache jewelry is to die for. Inspirational Beading: When did you first get started with soutache bead embroidery? Tiziana: I started about a year ago. A friend of mine told me about this lovely technique. At first I did not want to try because I knew that I would love and I abandoned my other passion, the assembly of the beads with different techniques peyote, herringbone etc, but then curiosity prevailed, and then I fell in love of soutache! Tiziana: I remember very well my first piece: a real disappointment! Creating it I realized that there was much to learn about this technique that requires a lot of precision and also a lot of practice. From that moment I have never stopped, I had to make several attempts before being able to see an object “go out” of my hands and say: "ok, well done“. I treasure my first piece , it's nice to see the progress I've made, but it is the first "son" and then I MUST to love it. Tiziana: Mortira , it's easy to find inspiration for those who, like me, are lucky to live in a beautiful land: Tuscany. In the place where I live have found inspiration great artists, there was born the movement of painters "Macchiaioli" (Fattori, Lega, Novelli). I am very small thing compared to them, but the colors that my eyes see are the same ones who saw them. Seascape and Landscape: the sea, the hills, golden fields of wheat, the colors of the flowers. Seasons that pass nourishing the soul of beauty without limits. Tiziana: The most beautiful moment in the creation of a jewel is the one immediately following the selection of the colors and their combinations. At that moment, I have to decide what to accomplish: a pendant, a bracelet, a brooch , earrings... I start working and going forward I try to understand what has to be born by the interweaving of threads and beads. It's always a surprise why I not design anything before start, I let myself go to the inspiration of the moment. Inspirational Beading: What are some of your favorite beads or materials to use in your work? 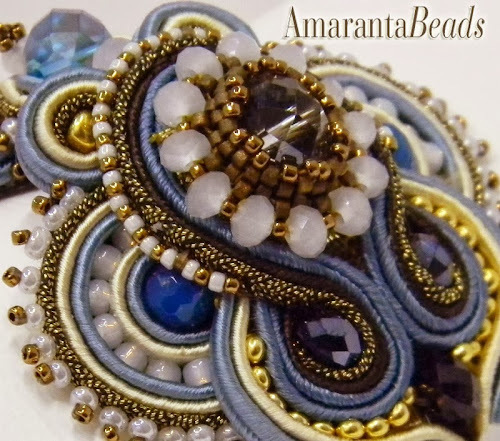 Tiziana: I use high quality soutache combining it with Swarovski crystals, gemstone, seed beads and Delica Miyuki. Inspriational: Beading: What is the most exciting designs in your shop right now? What makes it special? Tiziana: Harmony, positivity. If the objects hold the memories, I hope that those who wear my bijoux living the same good feelings that I live when I create them. 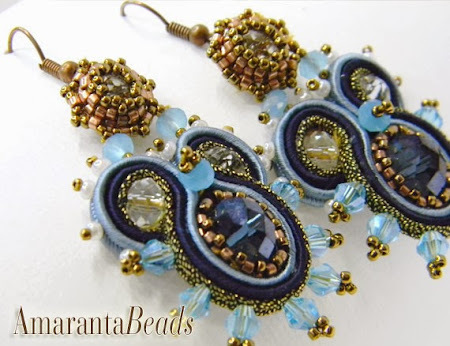 You can see more lovely soutache jewelry designs and inspirations at SoutacheArt.com and in Tiziana’s Etsy shop Amaranta Beads. 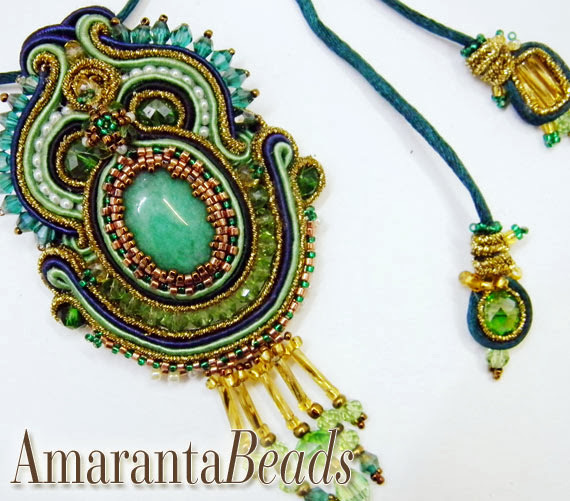 Follow along with Amaranta Beads on Facebook and Twitter to see the latest pieces. 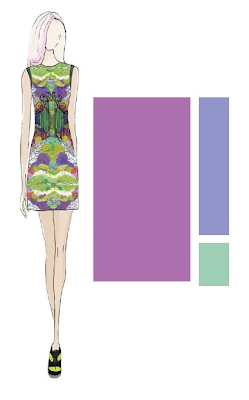 This week’s fashion color trios are inspired by Rebecca Minkoff’s sketch for the Pantone Spring 2014 lineup. I can’t decide which I like more - the amazing shade of Freesia yellow, or Rebecca’s perfectly subtle use of the colors on chic neutrals. The trio of Freesia, Celosia Orange, and velvety Hemlock would look amazing in statement jewelry as well as patterned beadwork. Just imagine a crocheted rope with these spring hues! It was a bit of a challenge to find the right balance of colors for this collage, while still keeping the pieces that I really liked together. I definitely wanted to keep some of the black-and-white striped elements, as well as tunic style tops. The bold yellow leather statement necklace is a great piece for just about any palette - it would be just as suitable for fall outfits, too! Since the yellow is so intense, I also went heavy on the orange and left the hemlock in the background - just a touch here and there to keep things from looking like a fruit bowl. Three Leather Necklace Tutorials by Cotton+Curls: These super simple leather and chain necklaces would look fantastic with some additional Swarovski crystal or Czech glass. Leather Leaf Necklace Project by Missie Krissie: This project can go from a fall design to a spring sensation by including beads in cool tones like sky blue and hemlock green. DIY Suede Fringe Necklace by Pop Champagne: A bit of sari silk included in this simple design would make for a gorgeous pop of color. Enameled Flowers Spinner Ring by Beadaholique: This ring project would look beautiful in any color combination. 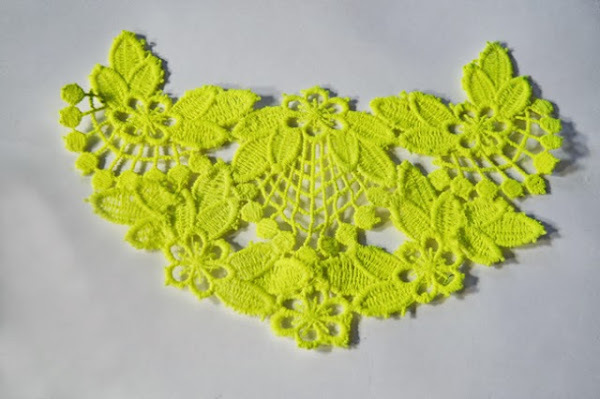 Neon Lace Necklace Tutorial by A Matter of Style: This project idea is great on its own, or as a base for an amazing embroidery project. Do you like to use bright and vibrant colors in your designs? What shades are your favorite? This week I’ve been working on a new Egyptian Gods design for Thoth, the ibis god of scribes. It’s been slow going, since the design I chose requires a lot of prep-work. I had planned to save this idea for the next challenge, but I couldn’t resist giving it a try, especially with all of the potential it has for lots of stripes. I've been eager to turn my wavy square stitch bracelet into a necklace for ages, and this seemed like the perfect time to try - especially since many of the other pieces I'll be ending the challenge with will be ropes. I wanted a collar that was totally new. I hadn’t planned on using any accent beads, but right at the last minute I decided to add some lovely blue daggers. I needed to add extra shapes somehow, to give the finished collar a look worthy of an ibis-headed god. I’m also not sure if I’ll stick entirely to my original palette. I’m waiting to see what the beads tell me to do. Tefnut’s necklace turned out great. I had a hard time choosing just a few accents from all of the great possibilities, so I ended up using them all. What better way to dive into the new year than to combine some of the most exciting new beads with gorgeous spring colors? Our fabulous friends at Czech glass purveyors The Best Beads have offered a gorgeous giveaway filled with round seed beads and Twins in gorgeous shades of green and purple. These two-hole Twin beads have the same curvy appeal as magatamas, and have been making a lot of appearances in new jewelry designs and projects since they were released by Preciosa. The prize pack includes 25 grams each in velvety Jet Violet, Cyan, Magenta and Olive Green. Coordinating 25 gram packs of 10/o seed beads are also included in Iris Magenta and Green. For a chance to win samples of all the beads shown, head over to Best-Beads.com to check out their fantastic selection of Czech glass seed beads. Then return to Inspirational Beading and leave a comment letting us know which shape and color is your favorite! One lucky winner will be drawn on Wednesday, January 22nd. This giveaway is open to all international readers. Update: This draw is now closed. Polymer clay is a fantastic medium for creative jewelry artists, especially for those that design unique and whimsical pieces that inspire our imagination. One such artist works in miniature, fashioning tiny wearable meals for every taste. Today Rhonda from Neat Eats shares some of her favorite inspirations for incredibly realistic food jewelry. Inspirational Beading: When did you first get started with polymer clay? Rhonda: I started with polymer clay a couple of years back. I had loved using Plasticine as a child but always got so frustrated that my little 'sculptures' got destroyed so easily and so when I decided to take up a new hobby I realized that polymer clay was the perfect medium to create what I had always wished to do as a girl. I started off making pieces for family and friends but then word of mouth spread and I started to get orders, which led, in turn, to opening a couple of online shops. Rhonda: My first piece was a little pair of donut earrings which I gave to my daughter and which she still wears. Then I decided to make everyone in my family their favorite meal as little fridge magnets. Not such an easy task as the meals varied from blackened sole on a bed of mash to lamb cutlets with all the trimmings! Rhonda: Mainly (because most of my pieces are food inspired) I look through food magazines, watch cookery programmes or peruse the shelves of local supermarkets and delis. Of course I have to buy pastries and cakes just to make sure I am copying them faithfully, nothing to do with the fact I love eating them! Rhonda: In 'real' life I am a full time artist and lecturer and so I think I have carried that over into my clay work. I visualize exactly what I want to create and how it will be laid out, and also exactly how I will make each component, before I even lift a piece of clay, which is exactly how I would go about creating a painting. If I don’t like how a part 'looks' I change it and then work out how the change will be made. Only when I can visualize the finished piece and I am happy with it will I then start to model it. Rhonda: I don’t really have a favorite color but I have found, since starting to make the jewelry that an awful lot of foodstuffs are yellow or orange which I had never realized! Inspirational Beading: What are some of your favorite tools or materials? Rhonda: I prefer the Fimo brand of polymer clay and I also use their soft clay as I find that using the harder clays is too sore on my hands, if I have a lot of it to condition (working the clay with your hands until soft and malleable). I have a large pin tool that is so battered and abused looking but I use it for everything and a couple of little pin tools that I made by just sticking ordinary sewing needles into some clay, molding the clay to make little handles and then baking. I also use a blade cutter and an X-acto knife. I have a couple of old wall ceramic tiles to bake the clay on and little foil pie trays to cover the clay whilst it is baking to prevent the clay from scorching. Rhonda: I am working on a whole new set of jewelry at the moment, using the polymer clay appliqué technique, which I am very enthused about. These are little pictures made by applying clay onto a clay background and so far I have made these into rings, pendants and brooches and should be listing them in the shops very shortly. At the moment I am working on flower themes. Rhonda: From the very start my jewelry has made people smile. I discovered this when I attended my first craft fair and set up my stall. After about a half hour it was surrounded by customers laughing at the items for sale. Whether it was because they are so small and unlikely items for jewelry or because people had discovered a piece which was nostalgic for them and made them remember a favorite childhood treat. I loved the way everyone left the stall smiling so that is what I try to do with every piece, make someone smile! You can see more amazing miniature food jewelry designs or request a recreation of your favorite meal at Rhonda’s Neat Eats shops on Etsy and ArtFire. Looking ahead to a new year of beading ideas, I can’t help but get excited about all of the designs and techniques I want to try. Of course, there’s always a fresh crop of interesting beads on the horizon, too! I’m compiling a new year’s resolution list of beads to try in 2014, but in the meantime, I’m also eager to try out some of last year’s acquisitions. I had so much fun getting back into bead embroidery in 2013, and I hope to experiment with it even more. I’ve been slowly cultivating a new collection of coin beads to help with inspiration, particularly for medallions. These tiny 6.5 mm Czech glass flat rounds from Fire Mountain Gems are perfect embroidery accents, and the gorgeous opaque blue color will make for some beautiful designs. Several weeks ago I needed to stock up on pinch bicones for a custom project, and I couldn’t resist grabbing a few for myself from The Dutch Tulip. It’s been ages since I’ve had any in my stash, and most of them ended up featured in my destash challenge, so this time around I went with a color that I’d be sure to use often. The opaque lime green is just calling out to be paired with some delicious aqua! Finally, I’ve got my eye on a few lovely tagua pendants from Lima Beads. I had many plans for simple jewelry designs last year that didn’t really get off the ground, but I’m still thrilled to have the supplies. I can’t wait to find new ways to use these pieces, if only because they are so touchable. Do you have a favorite bead type for the new year? One of the best things about changing seasons is the abundance of inspiration that comes along with it. With spring just around the corner, now is a great time to start planning fun summer jewelry designs and color palettes. Before too long, butterflies and flowers will be our muses again! This year I want to try something a little different with jewelry and fashion collages inspired by the spring color picks from Pantone. 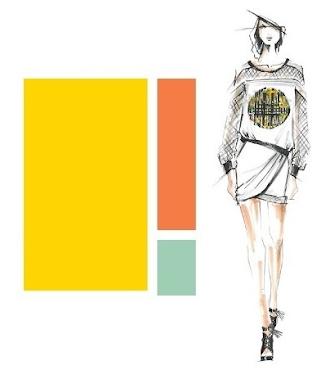 I’m always really intrigued by the designers’ sketches using the signature colors for women’s fashion, and this time around I’ll be using them as a springboard for jewelry ensembles, rather than dividing the season’s palette into separate trios. To start things off right, this week I’m working with a palette including the Color of the Year, Radiant Orchid. This trio and sketch was created by Jackie Fraser-Swan, and also includes 2014 colors Hemlock and Violet Tulip. I was instantly drawn to the print dress with hints of lime green, not to mention the challenge of blending these three colors together for two different outfits with the same jewels. A gorgeous multistrand necklace is perfect for just about any outfit, and I couldn’t resist going with the Hemlock hues of green opal. I didn’t find a dress that was quite as stunning as Jackie’s, but the purple print crepe dress I came across was a great substitute. On the other side of the scale I chose jeans and a simple top with a really fun orchid jacket. It was difficult to locate pieces with the same dusty blue as Violet Tulip, and I found the palette was really calling out for more blues. A few splashes here and there really helped to ground the very airy greens and purples. Are you getting ready for spring designs? Which colors do you turn to for pretty pastel jewelry? Things are finally staring to move along in my studio this week. I took a short break from the Egyptian gods to get started on my Ugly Necklace design, then packed it all away to start on a necklace for Tefnut. The goddess of moisture and wife of Shu proved to be a very easy inspiration. She is associated with the moon and cobras, so what better way to represent her than with a blue and white beaded rope? I haven’t decided on any accents yet. I wanted to jump right in with this piece and just see where it lead me. Rather than work out a snake pattern like for Apep’s necklace, I went with a simple Egyptian stripe design. Once the herringbone rope is complete, I’ll have to comb through my stash to find just the right accents for some fringe. Shu’s lariat turned out really great. I couldn’t decide which colors to use in the fringe, so I went with a combination of al the neutrals in turn. Although the color block effect isn’t as obvious here, I still love the way things turned out, especially with all that lovely Java glass. Hopefully there will be some good light for photography this week so that I can get caught up on finished designs. Most beaders know about the historical origins of their favorite stitches, but it’s not often that we really consider how much of our craft comes from the innovation of generations past. In her beautiful book, Theresa Flores Geary brings traditional techniques and motifs together with modern design styles in a way that will appeal to any beadweaver. Creative Native American Beading isn’t just a collection of traditional projects, but an excellent guide to the basics of beadwork, with a focus on the origins of stitches and materials. Although the projects featured use modern beads like Delicas, the heirloom quality of the designs is unmistakable. Bead lovers will recognize familiar patterns such as the Kokopelli, and designs like the beaded hatband or amulet bag. The book begins with an brief guide to traditional beadwork and getting started with the craft, including details on choosing the right beads and materials for your projects. Next, readers can dive right into the 19 gorgeous projects, ranging from very simple jewelry to elaborate décor items. The techniques explored include Apache weave (brick stitch), appliqué bead embroidery, tubular netting, Huichol-lace netting, and ladder stitch, plus odd-count, sculptural, tubular, and freeform peyote stitch. 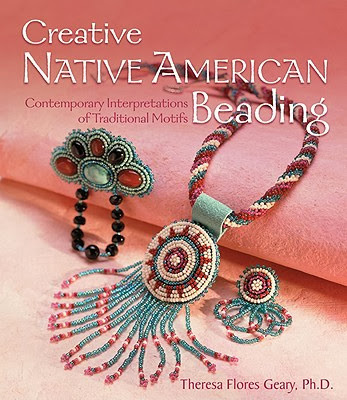 Creative Native American Beading is an ideal guide for new beaders looking to start with an historical approach to beadwork. Experienced beadweavers will love the back-to-basics themes that are anything but ordinary. Although I was prepared for having very little time to bead this past December, I had no idea just how long I would end up going without picking up a needle and Fireline. Way back in the very first week of December, I shared a quick look at one of the final pieces in the Egyptian Gods series. The lariat that I had started for Shu is still not complete, although now that I’ve got my groove back, it should finished by tomorrow. Knowing that I’d be way behind in finishing this year’s challenge doesn’t make it any easier to accept that I’ve missed a deadline. I was already a little sad that I would have to break with tradition by not making the final design in a rainbow palette (unless I have time for one more Isis necklace). If I work really hard, and it doesn’t take long to complete my entry into this year’s Ugly Necklace Contest, I should be able to start my 2014 challenge by the end of January. Wish me luck! What projects are you planning for this year?